One of Nairobi's Biggest party will go down this coming weekend at the Skylux Lounge which will see a number of artists both from kenya and Tanzania performing at the event. 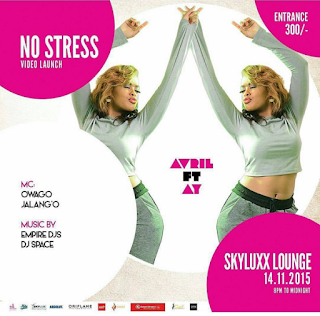 The climax of the party will be the much awaited performance and video launch of Kenya's Avril in collabo with Tanzania's AY in the song No Stress. The last time the two worked together was 5 years ago when they did a remix of AY's song Leo which became a hit. Among the artists who will perform include King Kaka, Femi One and AY. The main Mcs for the night will be Owago Onyiro and Jalang’o.